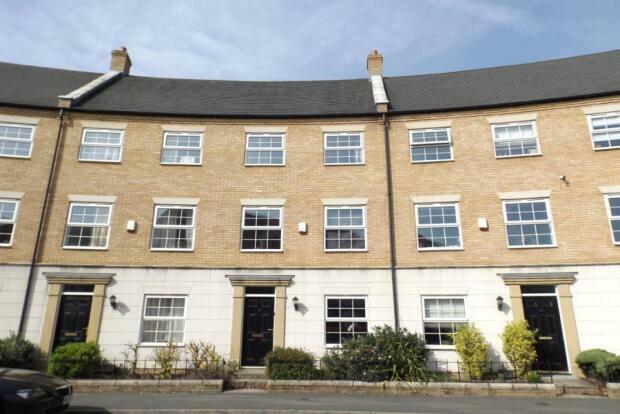 3 Bedroom House To Rent in Derby for £875 per Calendar Month. A partly glazed door leads into the entrance hallway with quality wood effect laminate flooring, fuse board, thermostat, alarm panel, telephone point, radiator, smoke alarm and stairs to all floors. Tiled flooring, radiator, extractor fan, low level WC and pedestal sink with tiled splash back. Laid with solid oak-wood flooring and beautifully decorated with poppy burnt orange and cream wallpaper. Complete with gas central heating and double glazing windows. Laid with grey slate ceramic tiled flooring, partly tiled walls and neutrally painted dÃ©cor, spot lighting to the ceiling and comprising a fully fitted kitchen to include a matching range of wall and base units with worktop over, one and a half bowl sink and drainer, integrated electric oven, gas hob, extractor hood, central heating boiler concealed in wall unit and under counter appliance spaces for a washing machine, a dishwasher and a tumble dryer. Boiler concealed in wall unit. UPVC double glazed French doors leading to the rear garden and gas central heating. UPVC double glazed window to the front elevation, radiator, smoke alarm and stairs leading to the second floor. Laid with a Saxony cream carpet and neutrally painted dÃ©cor. UPVC double glazed window to the rear elevation, UPVC double glazed French doors with a Juliet balcony, radiator and TV aerial points. Laid with a Saxony cream carpet and neutrally painted dÃ©cor. Complete with UPVC double glazed window and gas central heating. Tiled flooring, partly tiled walls, spot lighting to the ceiling, radiator, extractor fan, UPVC double glazed window with obscure glass to the rear elevation and comprising a low level WC, pedestal sink and double shower cubicle with electric shower. Tiled flooring, party tiled walls, extractor fan, radiator and comprising a low level WC, pedestal sink, panelled bath with double head shower over. To the rear of the property there is an enclosed rear garden which has a fenced boundary with gate leading to the garage. The garden is mainly laid to lawn with stabbed patio and pathway. Having an up and over door with power and lighting. A tarmac driveway leads to a parking space.